Purpose: The building was constructed as the Palace for the Great Duke Michael Pavlovich, son of the emperor Paul I and brother of emperors Alexander I and Nicolas I. 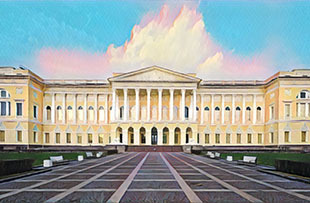 At the end of XIX century, the collections of Russian art from the Hermitage, the Academy of Arts and palaces were transferred to the Russian Museum. That is how Russian Museum of the Emperor Alexander III was founded. About Museum: This is the biggest collection of Russian Arts in the world. Here you can see the most beautiful works of such Russian artists as Karl Bryullov, Ivan Aivazovsky, Ilya Repin, Peredvizhniki, Kazimir Malevich, Wassily Kandinsky. Unlike the Hermitage, there are practically no queues and huge crowds in the halls. Russian Museum is the very place for Russian painting and Russian culture lovers. Working hours: 10am-6pm; Mon: 10am-8pm; Thu: 1pm-9pm. Day off: Tue. Tickets: adult – 400 rubles, students –200 rubles, children under 16 – free of charge.